The Polysex mod adds an additional control panel to your Korg Polysix synthesizer to increase the number of possible sounds you can create. The pitch mod routes the envelope to the pitch. You can choose the polarity of the envelope and the reference point in the envelope where the pitch is not changed. This mod is very useful to create portamento like effects, brass instruments, percussive sounds and much more. The second mod is the voice spread mod which is a very powerful tool. You can determine the amount of voice spread, route the envelope and one of two LFOs to it and switch voice spreading on and off in poly mode. This mod can be used to adjust and modulate the fatness of the sound in unison mode, in poly mode you can modulate how detuned the Polysix sounds. This can lead to more natural sounds, but can also be used to accomplish complex sound effects. The kit includes a PCB, all necessary parts and a front panel which you can use to mount the controls onto your Polysix. The front panel is black anodized aluminum with blue and white offset printing and done in Polysix style (see images above and below). Note that the blue color matches that of the Polysix very well. It is possible to use black knobs provided with the kit or the original Polysix style knobs (not included). The black knobs have a similar feel compared to the original knobs. 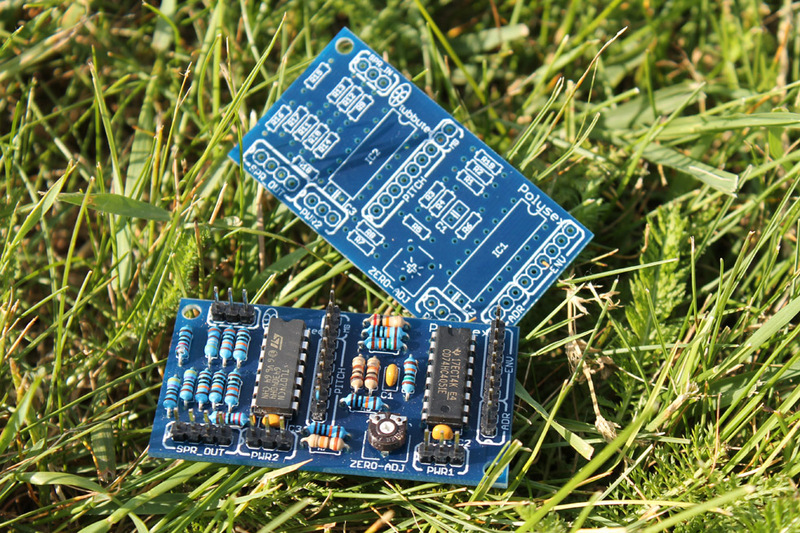 Both PCB and front panel have been produced in Germany. Is it difficult to build? No! 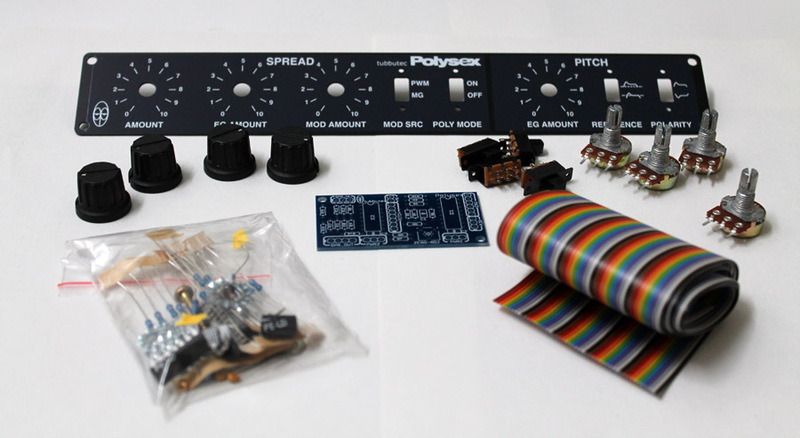 The Polysex mod was designed as a kit, which means I tried to make it as easy as possible to assemble and install it. You will need basic soldering and metal work skills, but nothing you can’t learn by watching half an hour of a soldering tutorial on youtube. You will have to drill some holes into the metal casing of the Polysix, but precision is not needed because everything is covered by the front panel and will look very nice. Also have a look at the construction manual. All demos are licensed under a CC BY-NC-ND licence. A simple arpeggio with mid attack and decay settings. The envelope to pitch amount is slowly increased to achieve a brass instrument like effect. Polysix in unison mode with the envelope routed to voice spread, long attack and release. At first the reference is set to the sustain level, so the sound starts very dissonant, becomes more consonant and fat until it becomes a slowly phasing sound. As the key is released it reverses into dissonance. The second time the reference is set to the zero level, the sound starts consonant, becomes dissonant and then consonant again. An arpeggio in unsion mode. The voice spread amount is slowly increased – the sound becomes fatter and denser. This sound demo uses voice spread modulated by the a fast PWM LFO. Chords with long release and short attack, envelope routed to voice spread, with the sustain level as reference. As the chords decay, the sounds becomes more and more detuned. Sometimes the attack is set longer to achieve a sound that starts dissonant and increases in consonance. The envelope is routed to the pitch to achieve a bass drum like percussive sound. The filter is modulated and different decay times and sustain levels are being set. 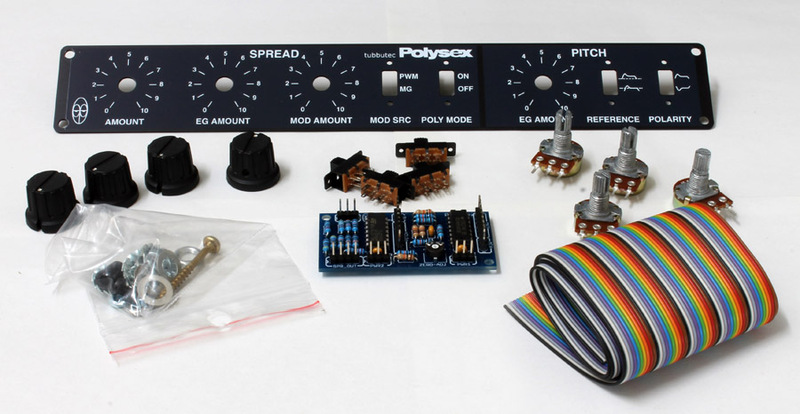 The Polysex mod is devided into two parts: The voice spread mod and pitch mod. The voice spread mod spreads the pitches of the six voices. It does it in such a way, that the mean pitch of the Polysix stays in tune. Spreading the voices is already used in unison mode of the unmodified Polysix to create a fatter sound, but with the Polysex modification a much wide range of sounds is possible. Very general speaking, in unison mode it controls the ‘fatness’ of the sound, in polyphonic mode it controls the ‘detunedness’ of the synthesizer. The ‘AMOUNT’ knob adjusts the amount of voice spread, the ‘EG AMOUNT’ the amount of modulation by the envelope and ‘MOD AMOUNT’ the amount of modulation by one of the two build in LFOs (low frequency oscillators). You can chose between two modulation sources with the ‘MOD SRC’ switch. You can either select ‘MG’, the Polysix’s modulation generator, or ‘PWM’, the Polysix’s PWM modulation generator. Use the ‘PWM Speed’ knob in the VCO section to control its speed. The ‘POLY MODE’ switch defines weather voice spread is activated in polyphonic mode (ON) or just in unison mode (OFF). The pitch mod routes the Polysix’s envelope (EG) to the voice pitch. This can be used for example for portamento like sounds, percussive instruments, brass sounds and a wide range of experimental sounds. You can chose the amount of the modulation with the knob labeled ‘EG AMOUNT’. Furthermore you can chose the polarity of the envelope with the ‘POLARITY’ switch. If the switch is in the upper position, the voice will pitch up during the attack phase and pitch down during the decay and release phase. With the switch in the lower position, the voice will pitch down during the attack phase and pitch up afterwards. You can also select the reference point of the pitch change with the ‘REFERENCE’ switch. This is the point in the envelope where no pitch change takes place. It can be selected to either be the sustain level, or the zero level as indicated by the dashed lines in the pictograms. The ‘REFERENCE’ switch also acts on the voice spread section. There also is a video describing the mechanical construction. Here you can order the Polysix mod online. You can chose between different versions below. We ship from Germany and the shipping costs depend on the destination country. If you want us to install the mod for you please contact us. Full kit including PCB, all necessary parts, front panel and black knobs. The knobs have a similar feel compared to the Polysix knobs and you can also use the original ones. Q: Is the Polysex mod compatible with the Kiwisix retrofit? A: Yes, but it uses the effect section LFO (0.1-7Hz) instead of the PWM LFO and the MG LFO is a square instead of a triangle waveform. There are detailed installation instructions in the construction manual. Q: Is the Polysex mod compatible with other midi retrofits? A: As far as I know it is compatible with every other midi retrofit, such as PolysixM, CHD’s P6-KBD or Korg PS6-MRK, and of course the Tubbutec Modysix. If in doubt contact us. Q: Can provide schematics or graphic files? A: Polysex is open source hardware. Wer sich klanglich erweitern möchte, wird sich sicher über Polysex freuen. Besonders die Tuning-Änderung für ein mehrstimmiges Instrument ist etwas für Leute, die Details lieben und um einem bekannten Klang etwas spezielles aufzusetzen, und es hebt sich damit von den Seriengeräten ab. Translation: Anyone who wants to extend soundwise will be happy about Polysex. Especially the tuning-changes for a polyphonic instrument is something for people who love details and to add something special to a known sound and it thereby stands out from series equipment. Mit Polysex werden die Klänge eher neblig, unscharf oder melancholisch, und, wenn es zu stark eingesetzt wird, natürlich auch “besoffen”, krank oder schräg. 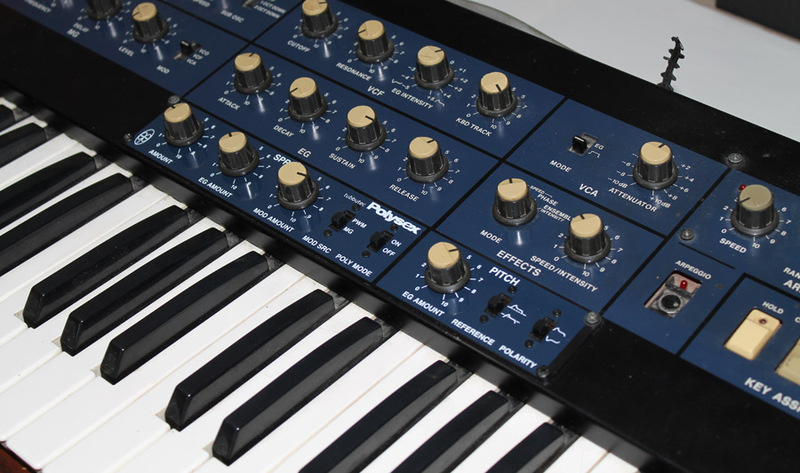 Der Synthesizer wird vielseitiger. Each voice taking awhile to come into tune and every voice just a little different from each other. You can get lost for days just getting creating sounds and arpeggiating them.